The Roosevelt Silver Dime was struck by the United States Mint from 1946-1964 from a composition of 90% silver. When first produced, each dime contained .07234 ounces of the precious metal. These coins replaced the Mercury Silver Dime, also known as the Winged Liberty Head Dime, which had been manufactured between 1916-1945. The creation of the Roosevelt Silver Dime was brought about by the unexpected death of President Franklin D. Roosevelt, the 32nd President of the United States. Within a short time after his death, legislation was introduced calling for the new dime and design work began almost immediatly. Owing to the short lead-time for the coin, it marked the first time a United States Mint employee would design a circulating coin for the United States in over 40 years. The task went to Chief Engraver John R. Sinnock who had already completed a medal with a portrait of Roosevelt. Less than nine months after the death of Roosevelt, the new dime honoring him was released to the public on January 30, 1946 — a date which would have been Roosevelt’s 64th birthday had he lived. These coins were struck by the billions making them relatively common for collectors. However, many consider the Roosevelt Silver Dime to be in its infancy and expect values to continue to rise. 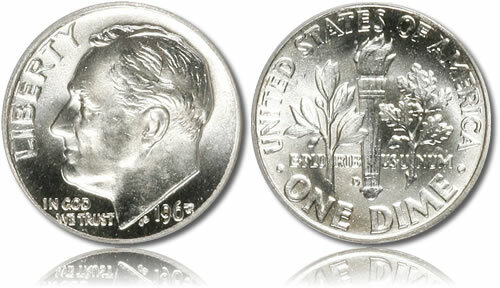 Shown on the obverse of the Roosevelt Silver Dime is a portrait of Franklin D. Roosevelt, the 32nd President of the United States. Surrounding the portrait are the inscriptions of LIBERTY, IN GOD WE TRUST and the year of minting. The reverse shows an olive branch, a torch and an oak branch. Included in the design is the inscription of E PLURIBUS UNUM with the inscriptions of UNITED STATES OF AMERICA and ONE DIME surrounding it. The mintmark, if any, is also shown on the reverse.